Pages etc. : Reprint of 1890: xi+144p., full of col. illus., 34x23cm. 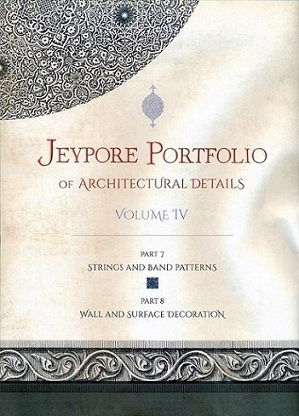 The Jeypore Portfolio comprises 12 parts which will be published by Studio Orientalia in 6 volumes. Vol. I: Part 1 Copings and Plinths & Part 2 Pillars - Caps and Bases; Vol. II: Part 3 Carved Doors & Part 4 Brackets; Vol. III: Part 5 Arches & Part 6 Balustrades; Vol. IV: Part 7 String and Band Patterns & Part 8 Wall and Surface Decorations; Vol. V: Part 9 Dados & Part 10 Parapets and Friezes; Vol. VI: Part 11 Chatris and Domed Roofs & Part 12 Jharokas or Balcony Windows. (Parts 7-8 have never been reprinted before).